Identify a material as an element, compound or mixture; identify a mixture as homogeneous or heterogeneous; and/or identify a mixture as a solution, colloid or suspension. Identify the solute and solvent composition of a solid, liquid or gaseous solution. Express the concentration of a solution in units of ppm, ppb, molarity, molality, and percent composition. Describe how to prepare solutions of given concentrations expressed in units of ppm, ppb, molarity, molality, and percent composition. Investigate factors that affect the rate of solution. Describe how to prepare a specific dilution from a solution of known molarity. Determine the colligative properties of a solution based on the molality and freezing point or boiling points of the solvent. Use a solubility graph, composition of a solution and temperature to determine if a solution is saturated, unsaturated or supersaturated. 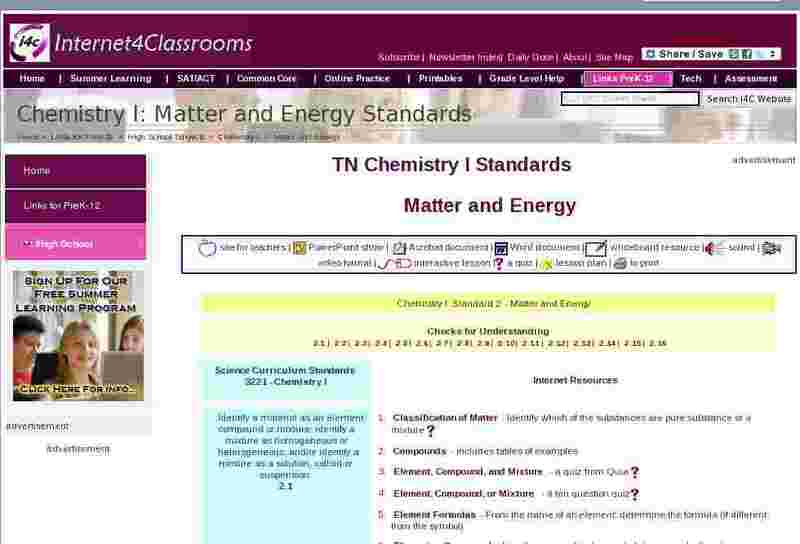 Classify properties and changes in matter as physical, chemical, or nuclear. Use calorimetry to: identify unknown substances through specific heat, determine the heat changes in physical and chemical changes, determine the mass of an object, and determine the change in temperature of a material. Perform calculations on heat of solvation, heat of reaction, and heat of formation, and heat of phase change. Use particle spacing diagrams to identify solids, liquids, or gases. Distinguish among solid, liquid, and gaseous states of a substance in terms of the relative kinetic energy of its particles. Use a phase diagram to correlate changes in temperature and energy with phases of matter. Graph and interpret the results of experiments that explore relationships among pressure, temperature, and volume of gases. Distinguish among elements, compounds, solutions, colloids, and suspensions. Identify properties of a solution: solute and solvent in a solid, liquid or gaseous solution; procedure to make or determine the concentration of a solution in units of ppm, ppb, molarity, molality, percent composition, factors that affect the rate of solution, and colligative properties. Classify a solution as saturated, unsaturated, or supersaturated based on its composition and temperature and a solubility graph. Classify a property of change in matter as physical, chemical, or nuclear. Compare and contrast heat and temperature changes in chemical and physical processes. Investigate similarities and differences among solids, liquids and gases in terms of energy and particle spacing. Predict how changes in volume, temperature, and pressure affect the behavior of a gas.